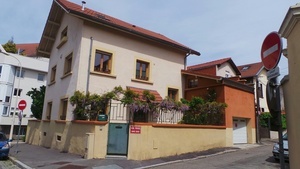 LES CHAMBRES DE VILLEBOIS are located in a residential and quiet area of the third district of Lyon, near the train station of La Part Dieu SNCF-TGV and EUREXPO by tramway. Two spacious guest rooms are at your disposal, both equipped with an individual shower room with toilets. For professional or touristic stay, you will appreciate the quiet area of the two rooms of LES CHAMBRES DE VILLEBOIS. Totally renoved in 2015, the rooms are equipped with air-conditioning, free Wifi, individual shower room with toilets. You will alos enjoy the private living room, with kettle and coffee machine, and relax with books, magazines and touristic brochures about Lyon and surrounding area. The breakfast is served in the family dining room or in the garden, on sunny days (tea, coffee, chocolate, fruit juice, home-made marmelades, cereals, bred, home-made pastries, fruit). Parking possible.Going to the train station TGV La Part Dieu or to the RHONEXPRESS to go to the airport Saint Exupéry will take you 10 min by the tramway. If you need to go to the exhibitions center EUREXPO, it will take you 30 min. ride by the direct tramway. And the touristic city center is located at 20 min. ride by the metro line. LES CHAMBRES DE VILLEBOIS are located at 5 min. ride from the tramway Dauphiné Lacassagne station or at 15 min.ride of the metro line Sans Souci station.